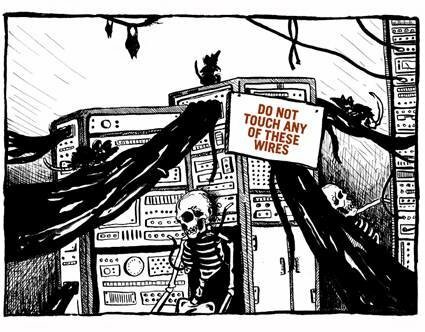 In this fifth slide of the data center house of horrors slideshow, one data center's servers are housed in the janitor's closet. Someone from a small company with about 100 employees asked for help with some server upgrades. When I arrived on-site, I asked to see the data center. The IT manager told me that the organization used to have a nice room for its servers, but a company executive took the space over for a bigger office. His old office went to the executive’s given assistant. I asked the IT guy to show me where the servers were. Much to my horror, they had been relocated to the janitor’s closet, which was infernally hot without ventilation. But there were even bigger problems. Two of the servers were wedged between the mop sink and the wall (you can’t make this stuff up). As if that weren’t bad enough, all servers were plugged into a single power strip that was connected to a switched outlet. Every time someone accidentally turned out the lights in the closet, it would cut power to all eight servers.